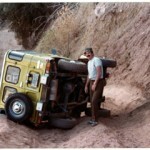 If you drove a Land Cruiser around Oxnard, California, in 1976 and Bob Garrett passed you in his FJ40 (that he purchased new in 1972), you would have received a wave and a big smile. Bob is a true Land Cruiser enthusiast and while searching for a Land Cruiser friendly club at the age of 22, he found the usual 4×4 clubs catering to nearly anything except Toyota Land Cruisers, and a feeling of animosity toward the “foreign Jeep.” Thus were sown the seeds of what was to become the largest national Off Highway Vehicle organization, now spanning 30 years—The Toyota Land Cruiser Association. Along with other Land Cruiser owners from the area (such as Dennis and Gloria Van Zandt, John and Melissa Fulton, Ed and Cathy Marzoff, and Terry and Carol Hillegoss), Bob originated the Toyota Land Cruiser Association club in January of 1976. Starting the Toyota Land Cruiser Association club was not easy. Bob and the other members placed ads in the local newspapers exclaiming their next meeting location and encouraging other Land Cruiser owners to join them. Bob met future member George Rice by stopping at George’s house after driving by and seeing George working on his Cruiser. Each of them owning a Land Cruiser was reason enough to warrant an introduction and henceforth a friendship. Bob and George were to become close friends and instrumental in the success of the fledgling association. Bob also had the foresight to realize that the association needed outside support to locate and draw in new TLCA club members, and fortunately for him local businesses also saw the value in growing the Land Cruiser community. Jim Sickles of Downey Off Road played a huge role in the early years of TLCA by providing products and services to the young association. Initial TLCA membership consisted of sixteen chapter members and nine associate businesses. It was also Jim who granted Bob the permission to use his business emblem as the association’s first logo. Bob liked the design and felt it clearly depicted the club’s vehicle of preference. Bob chose to color the logo red, white and blue not only to make it stand out against the many other cookie cutter 4×4 logos, but also because of the United States bicentennial celebration currently under way in 1976. This logo remained in use until 1993 and was adopted in many future TLCA chapter logos. Both Bob and George pride themselves even to this day when wearing their original TLCA Ventura Chapter jackets with the original logo. 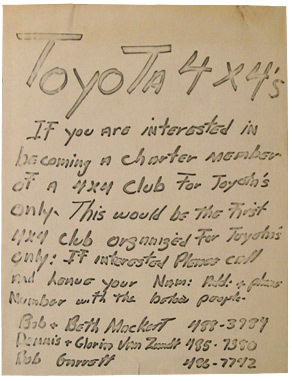 As the Ventura club began to take off in 1976, members Melissa Fulton, Diana Rice and Carol Hillegoss began creating the club’s first newsletter, The Landcruiser. 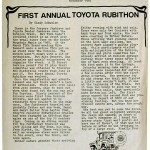 Melissa Fulton remained involved with the club’s newsletter and eventually became the first editor of what would become Toyota Trails. 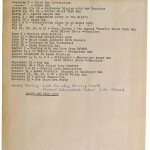 As it does today, TLCA maintained a busy calendar in the early years. All types of events including toy drives, clean ups, parades and four wheel drive runs (such as the yearly Thanksgiving Day Run) were planned for virtually every weekend. As most of the members were young or newlyweds, many had yet to have children and therefore had time to spare. 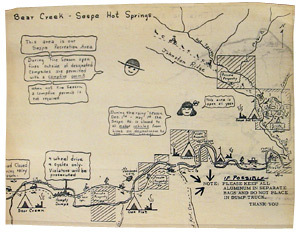 Gas was affordable, Land Cruisers were new on Toyota lots and OHV areas abounded within reasonable driving distances. Even though Bob spearheaded the creation of the Toyota Land Cruiser Association club, the idea of an association of Land Cruiser clubs working together for common goals did not take hold until late 1976, after Bob witnessed the phenomenal interest in and growth of the Ventura club. The friendly attitude, busy event calendar and monthly newsletter formula was working for Bob and he was ready to present his idea of an association: having other clubs join his association of Land Cruiser owners. But before Bob could approach other clubs about joining, he first had to sell his own club on the idea. The TLCA club members were supportive of his idea but knew their club would need to play a vital role. They wanted to make sure Bob’s association was well thought out, and with that assurance provided him their full support. It wasn’t easy selling his idea to another club though—it took some salesmanship. 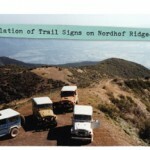 It was not uncommon for Bob and other TLCA Ventura club members to travel to various Land Cruiser clubs and pitch Bob’s idea about an association that was comprised of individual clubs united together into an association that fostered friendship and sharing of ideas and knowledge. Many clubs were concerned about losing their autonomy. The first hurdle Bob had to clear was instilling confidence that the club would remain uniquely itself, although affiliated with the association. 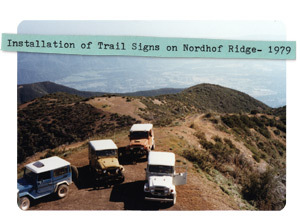 Bob built upon the frustrations many clubs were experiencing with CA4WD at the time and believed a more unified voice of concern would help spur CA4WD to more action against trail closure. In turn the association gained membership from the club. The first club to join the association was a club called TLCA Los Angeles County. They were soon joined by Silver State 4 Wheelers, Mountain Transit Authority, TLCA Madera County, TLCA Modesto County and Golden State Cruisers. 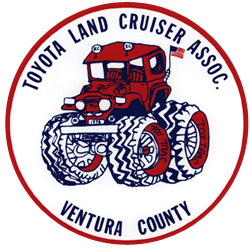 When the association began to gain clubs (or what is now referred to as Chapters), the Toyota Land Cruiser club based in Ventura ceased to be the TLCA club and became one of the Toyota Land Cruiser Association’s chapter clubs—TLCA Ventura County. 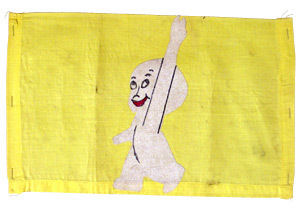 The TLCA effectively hatched and took flight in 1977 with a handful of chapter clubs. 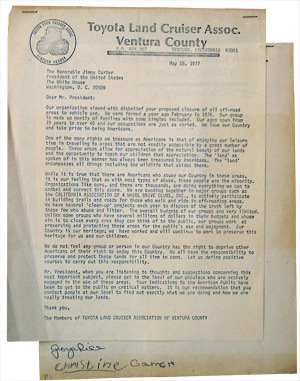 Bob Garrett served as the president of the renamed TLCA Ventura County club in 1977 and the new association’s membership was primarily Chapter members. The association relied upon the local chapter newsletters to spread information about upcoming TLCA meetings and event information. Monthly TLCA meetings were held at various chapter member homes and it was not uncommon to attend a meeting in Ventura one month and then another in Madera the next. Participation was usually very good at these meetings with all chapters being represented well. There was no internet and PCs were not a household item. The only connection was face to face via TLCA meetings or Chapter hosted events. The association did well in its initial years and had created its own Board of Directors by the late 1970s. Many members of the chapter clubs were very involved with CA4WD and later helped new organizations like Blue Ribbon Coalition and United Four Wheel Drive Associations take off. 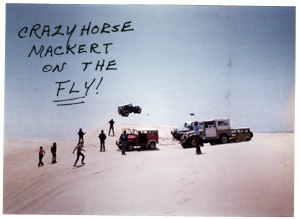 In the late 1970s it was noted at one CA4WD meeting that blue TLCA jackets with the bold red, white and blue Land Cruiser on the back were in the strong majority—and some long time CA4WD members were concerned that the Land Cruiser guys might try to exert their political strength and threaten certain icons like the Jeep in the CA4WD emblem. 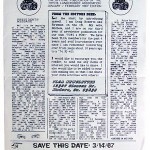 In late 1979, key players such as Bob Garrett, Morey Estrada and Dan Schueler, who were involved with the young TLCA BOD, realized that the archaic nature of relying on Chapter newsletters to spread TLCA information was unreliable. A more stable venue was needed to relay information to the Chapter clubs and the BOD presented the idea of raising TLCA dues from $5 to $10 with the idea of creating a newsletter which would be sent to all members. 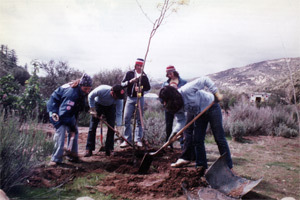 Thus was born Toyota Trails, with Melissa Fulton, long time TLCA Ventura County newsletter editor, volunteering to undertake the effort. 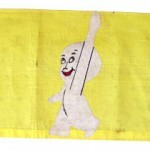 By 1983, new clubs such as TLCA San Fernando Valley, Texas Toys, and Toys on the Rocks had joined the association. 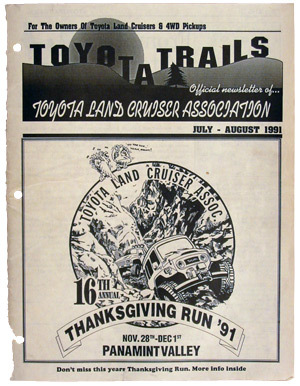 Craig Roberts had taken over as editor of Toyota Trails and the Thanksgiving Day Run was the association’s marquis event. 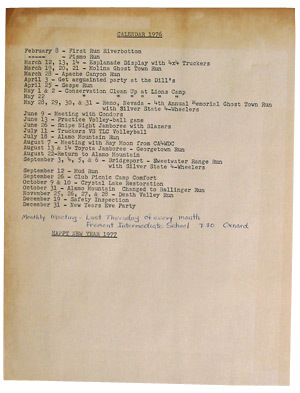 But past president Morey Estrada began to notice a plateau in membership and a faltering ledger sheet. 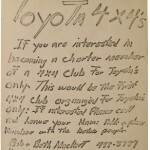 The TLCA was mailing out 200 issues of Toyota Trails but had only 76 members. Apathy had begun to set in. 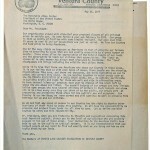 It was then that Bob Garrett assumed the role of TLCA President for his second term in 1983. One fall evening in late 1984, during TLCA’s annual Thanksgiving Day run, Bob Garrett was sitting around a campfire with his fellow TLCA officers and members Dan and Cindy Schueler, the Fultons, and George Rice (amongst others), and all specifically remember Bob saying, “We have less than $1000 in the bank and fewer than 100 members after 8 years—we can either push this thing forward or have one hell of a party!” They had all worked hard for the association and no one was ready to quit. Dan Schueler, a member of the very active TLCA Madera chapter (which later changed its name to Toys 4 Fun), took over as President of TLCA in 1985. 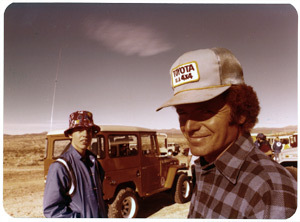 He and his wife Cindy, who had begun helping Craig Roberts with Toyota Trails, learned about the TLCA in 1980. 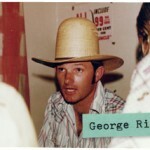 After being involved with the TLCA Board in the early 1980s, along with active participation in CA4WD and the young UFWD, Dan took over the reigns as President from Bob at the end of 1984 and they put their efforts into increasing membership and more importantly, bolstering the bank account. Dan actively sought new members and used any opportunity (such as attending CA4WD, BRC and United events) to market and sell TLCA. Dan specifically recalls being at the Jeep proving grounds in Michigan on United Four Wheel Drive business, wearing his blue TLCA Madera chapter jacket and promoting TLCA to anyone who would listen. 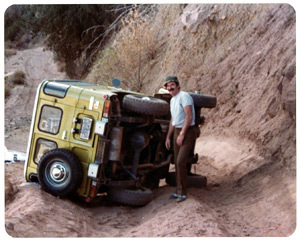 TLCA’s positive relationship with Land Cruiser oriented businesses paid off again in 1985 when Marv Spector of Specter Off-Road donated a burned out hull of a Land Cruiser at the request of Bob and Dan. It was basically a rolling frame and needed lots of work. The TLCA chapters went to work contacting various businesses asking for donated parts and supplies, and restored the Cruiser to pristine condition. 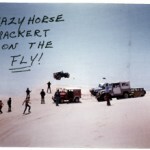 They then loaded the rebuilt Cruiser onto Bob’s trailer and drug it around California to various events and meetings throughout 1985, selling raffle tickets to the tune of $10,000. Thus was born the first truck raffle in TLCA and the income generated helped to propel the association through the late 1980s. It had been a critical year for the TLCA. Bob believes the successes they achieved in 1985 kept the association from folding. Dan noted that while the achievements in 1985 kept the association from sinking at that point, the next four years (through 1990) were also pivotal in the associations’ history. While 1985 propelled the association through the next few years, TLCA was struggling again in 1989 when VP Cindy Schueler took the reigns as TLCA’s only female President. While the association enjoyed a robust bank account, apathy was a paralyzing force. Key volunteers were running out of energy and moving on to other interests. Board meeting attendance had declined and the association had even lost chapter clubs and their membership. There were actually more associate businesses involved with TLCA than there were chapters. Cindy, who had been generating Toyota Trails since taking over as Editor from Craig Roberts around 1988, was running out of steam and the level of effort required was draining the association volunteers, even causing Toyota Trails to miss a couple of issues in 1990. 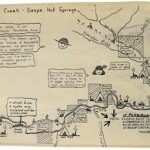 Still based primarily in southern California, the BOD members were trying to generate interest outside California with little success and having difficulty maintaining current chapter clubs. However, the work that these dedicated volunteers were doing was building the foundation for future success. Although they had suffered some setbacks, their efforts were about to be bear fruit. Gary Bjork, newsletter editor for the Toys on the Rocks chapter, approached Dan and Cindy with a proposal to create a professionally produced TLCA newsletter that would serve as the primary conduit for information within the association, and eventually become self sufficient based upon advertising revenue. The timing was perfect as Dan had been exclaiming to the TLCA BOD that additional and tangible benefit from TLCA membership was needed in order to stop the chapter attrition—and they needed another volunteer to produce Toyota Trails. Cindy Schueler had taken over both the President and Editor positions within the last 12 months and was out of energy, with Toyota Trails falling months behind schedule. Dan and Cindy presented the proposal to the TLCA BOD who voted in 1990 to approve Gary’s proposal to take over as Managing Editor for Toyota Trails as of the January/February 1991 issue. 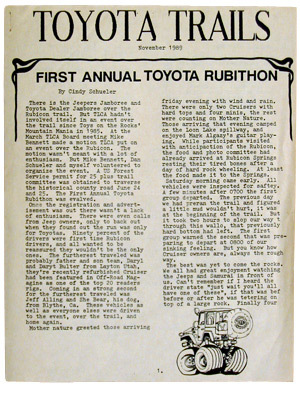 On another front, Toys on the Rocks members had been enjoying an event on the Rubicon trail called Toyota Mountain Mania, which was preceded by the Land Cruiser Jamboree. 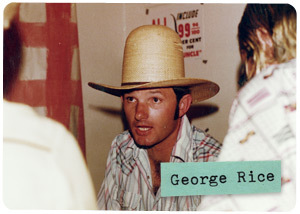 Seeing the success of this small run as an opportunity for the association, Mike Bennett suggested that TLCA take over hosting the event and presented the name Rubithon. 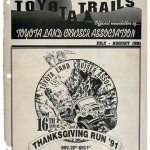 This new TLCA hosted event was the second primary event for the association in 1989, following the Thanksgiving Day Run which was in its thirteenth year. While TLCA originally initiated both of these runs to provide off roading opportunities for its members, the real benefit paid off for the association in the form of fantastic coast to coast media coverage. 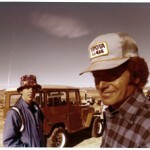 Dave Fryberger, Club Editor for Peterson’s Off Road, attended both Rubithon and the Thanksgiving Day Run in 1989. 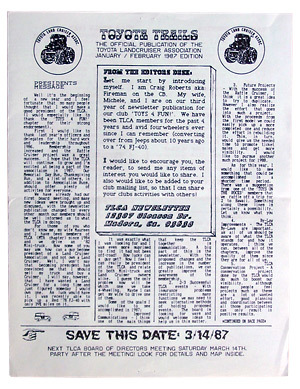 The articles he wrote coupled with other articles in 4 Wheel Drive Action and Off Road Magazine suddenly alerted the entire free world that a Land Cruiser specific “association of clubs” was available. After its first 13 years of existence, TLCA membership was at 191 in November of 1989. It had swelled to 300 members by the end of 1990! 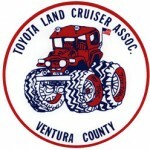 New Land Cruiser clubs were forming specifically to become TLCA chapter clubs. 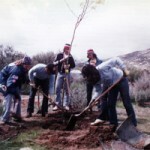 Southern Nevada Land Cruisers became the first chapter club outside California, and many others soon followed.